At WearForce we have a fully equipped workshop in Chalfont, Philadelphia, to make any kind of hammer rebuilds, bucket repairs, among other welding services. No job is too big or too small. We always strive to get it done according to the highest standards. 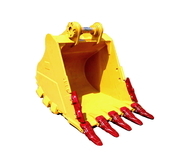 Full repair and maintenance service for any kind of buckets. A complete pneumatic and hydraulic hammer repair and rebuild service.